Wahl Elite Pro Review: Is It Worth It? There’s two things you would expect from a home haircut kit: a sturdy, powerful clipper, and enough accessories to supplement it. Some of the kits we’ve reviewed so far fit the bill properly. But none can match the class you’ll find with the Wahl Elite Pro clipper kit. Is it something about the luxurious Secure-fit stainless steel Wahl combs? Smoothly cutting blades? Or rather, its attractive price? I’ll elaborate on this kit’s fantastic sides and some of its shortcomings in this Wahl Elite Pro review. Let’s do this! As you can see, you have quite a few things included for your home haircut. But that’s just the dry facts. You could find that anywhere. Let’s get to the juicy parts: why this kit is such a gem and we included it in our best home clippers list. Home hair clippers are dominated by Wahl. You’ve probably seen the Color Pro lower budget kit from Amazon.com, or the Chrome Pro deluxe haircut kit we’ve already reviewed. With the Elite Pro, though, the brand has taken things further. This model is sturdier, its more powerful output is quite tangible, and there really is an “elite”, premium feeling to it. The hard plastic body with chrome-colored lines sure helps with that. 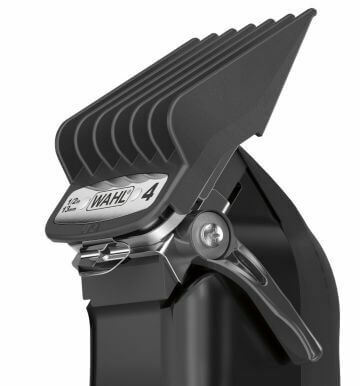 The Wahl Elite Pro motor outperforms other Wahl models easily. While the Chrome Pro will encounter some issues with thicker hair types and bulkier volumes, the Elite Pro will plow through them. I also really like the feeling it has when you pick it up. Sure, it’s a bit heavier than other clippers for home use, but it feels very professional. Some of the weight has to do with the more powerful motor of this model. The trade-off is definitely worth it in my opinion. Then there’s the blades. As you know, precise haircuts with more “problematic” hair types and volumes are achieved by both motor power and blade quality. 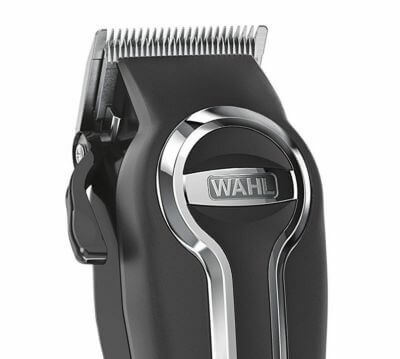 Wahl Elite Pro clippers come with special smooth cutting stainless steel blades. What I admire here is that they’re self-sharpening, so you don’t need to be that concerned with maintenance. Talk about two birds with one stone. Not only do you get a nice home haircut, but you also have an easier time keeping your clippers on point. On top of that, this set of Wahl home clippers is quite easy to use even by complete beginners. No, the Elite Pro’s guards aren’t fully made of metal. They are made of plastic, mixed with stainless steel for a secure, better fit. It makes for a completely new experience, really. The harsh truth is that both the standard Wahl and Oster guards are made of so-so plastic. It feels flimsy and you honestly wonder when the hell will you somehow break them. The Secure-fit Wahl metal clipper guards you have here don’t suffer from this problem. The hard plastic here is way sturdier and the metal part allows for extra durability. The fit to the blades is also tighter and better, meaning more precise haircuts with less mess. Not only this, but you get a full set of them, including the rare #1/2 and #1 1/2 Wahl guards. I’ll say it directly: the set of combs itself costs as much as a home clipper! It would be unfair to not present you with a fair and objective Wahl Elite Pro review. There’s a few things you should keep in mind about this haircutting kit. First of all, despite all the accessories you get, two semi-important ones aren’t included here. Yes, I’m talking about the left and right ear tapers. I don’t know why the company decided to skip on them, considering the abundance of other stuff they deliver to you here. The easiest thing you could do is to just buy the tapers separately from Amazon, they’re quite cheap. Or if you have ones left over from your previous clipper set, simply use them. Its motor is far from the Wahl Senior’s V9000 one, for example. Its blades won’t give you the fades a Wahl Legend will. As a clipper for home use, this model is king. But don’t expect barber-grade performance of it – and you really shouldn’t, considering its crazy good price. Last point I want to make is, due to its power, the Elite Pro might feel a bit heavy for some people. As I mentioned, this is not a problem for me, because the tradeoff is worth it. Just take into account the Wahl Elite Pro’s bulkier design. 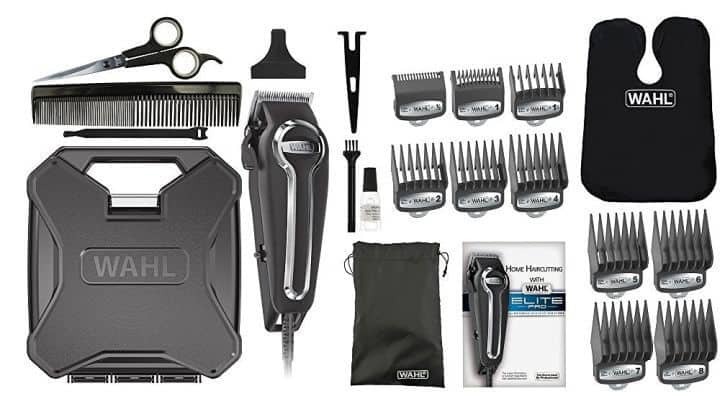 After doing this Wahl Elite Pro Review, I’d say that out of all the Wahl home kits, the Wahl Elite Pro high performance haircut kit #79602 is your best choice for an awesome haircut. It doesn’t hesitate to perform smooth cuts on whatever hair type it encounters. The Elite Pro motor blows away usual Wahl home clipper motors too. I’d go as far as actually dubbing this the best clipper kit among all the major players on the current market. Sure, you don’t have the ear tapers included. But you receive Wahl’s steel combs which, no joking, will completely transform how you do your haircuts. Side luxuries like the great barber’s cape and the tough storage case only put a Wahl cherry on top of it all. Do I think you should get this? Definitely, if you want a perfect haircut at home. The Wahl Elite Pro is just too good for you to skip on it. In case you prefer a full-blown barber machine, check our list with the best barber grade clippers. If you don’t like cords and the heaviness of the Elite Pro, there’s always our recommended picks for the best cordless hair clippers. Lightweight, maneuverable and portable: what’s not to like about that?! How would you compare these clippers to the Wahl 5-Star Magic Clip Cordless? I’m having trouble choosing between the two. What do you need them for – home use, or at a barbershop? For home users the Elite Pro might just have that package convenience with the metal guards (the Clips have the standard plastic ones that are flimsier) and all the capes and accessories. But as a pure machine, the Clip is way, way better. I’m in the market for a powerful trimmer for my thick beard, since my Braun BT5070 is annoyingly weak. I’m loving your reviews, and this Wahl looks like a good deal for around 50€. Would you recommend anything else in this price range? Now, Wahl Elite Pro’s main purpose isn’t to trim beards, but rather deliver nice haircuts. However, if you keep a longer/thicker beard, you should get pretty decent results by using the steel guards. I’d normally recommend an Andis T Outliner, but it works better if you keep a stubble (like I do currently.) Won’t be a viable solution for bigger beard styles. Have you looked into Wahl’s line of dedicated beard trimmers like the Lithium Ion series? They might be worth a look if you want to get a model that’s main purpose is to be a trimmer. But still, the Elite Pro should do fine too! Hi Alex, thanks for the recommendation. Fact is I don’t really trust cordless beard trimmers anymore, since anything I’ve tried felt like a “meh, I guess I’ll make this work” type or thing. A corded trimmer like the Elite Pro looks much more reliable and powerful. Who knows, I might start cutting my own hair further down the line. Right as I’m writing I’m realizing I might be sold on this! I kind of understand you – unlike many cordless clippers, beard trimmer still stick to older battery technologies and just recently some of them went the Li-Ion route. Alright, hope it works well for you! Just remember oiling it and cleaning it after every use – beard trimmers can do without that, but clipper blades will get dull in no time if you skip on cleaning them. Thanks I’ll make sure to take good care of it! Hi Alex, thanks for the recommendation. please give me guidance for selecting between WAHL “5 STAR LEGEND” and “Elite Pro”???? which one cut and shave more and output is smaller hair length? Are you sure you want a clipper for beard/mustache use? A trimmer would do a better job. Especially the 5 star Legend is a clipper meant to cut hair/perform fades; it’s not much about facial hair grooming. How close do you want to keep your beard/mustaches? I’ve used both for my mustache and beard needs. They’ll work better than a clipper! Bought the elite pros over a year ago when I noticed they had the steel clips on the guards. I didn’t even know the guards existed until I saw them with this kit at my local WM. Then I googled the price for just the guards. It was less than a $10 difference so I bought my guards at Walmart, that I cut professionally with, and also got a decent clipper for home use. Cheers to an excellent review of the best set of home clippers/professional guards out there. I too cant choose between the elite pro and the 5 star magic clip cordless clippers. i want them for home use but dont care too much about extras; i want to be able to cut my hair well and get a nice fade and precise cut for both my beard and my hair. what would you recommend and why? I’d rank the Elite Pro as a semi-pro clipper, while the 5 star Magic Clip is a full-blown professional machine. Now, if you don’t want too complicated of a fade or something good enough, the Elite Pro will fit the bill too. But the difference in blade quality is quite tangible with these two. Hi Alex. I noticed that Costco is carrying the Wahl Deluxe Haircut Kit. It looks very similar to the Elite Pro kit except this one comes with a trimmer as well. I am curious if whether or they are indeed the same product. If I am not mistaken, some electronic companies that sell to Costco alter the code/name/design of their product a bit. I googled for any info. online but I could not find any. I recently ordered the Rem. HC 4250 (great review btw) and thinking of adding an “Elite Pro” type quality clipper as well — either that or the Fast Feed. Thank you. Any idea what to do if my freezes when in a certain orientation? 3/4 upside-down when hitting the upper back of my head and the Wahl Elite Pro started freezing on my during just its second use. Super bummed. I oiled it straight away, as instructed, and it’s not freezing from binding up in hair, it’s definitely the orientation that gets it for some reason. I want to love it, please help! (My previous Wahl lasted many years with zero similar issues). Thanks for the comment Andy. If you clean out the hair clipper regularly and you made sure to oil the blades there shouldn’t be a problem. Did you make sure to oil the teeth of the blades and the back of the blades? You need to If you locate the taper lever on the side of the unit, right in front on the lever you should be able to see a small blade and a larger blade. Place a drop of oil on the end of the small blade on both sides. If it’s still not working, you can send a message to [email protected]. They should be able to give you more specific advice.